Tired of peppermint yet? I’m not either. I just can’t get enough of that cool refreshing taste and Peppermint Kiss Cookies have very quickly become my latest addiction. 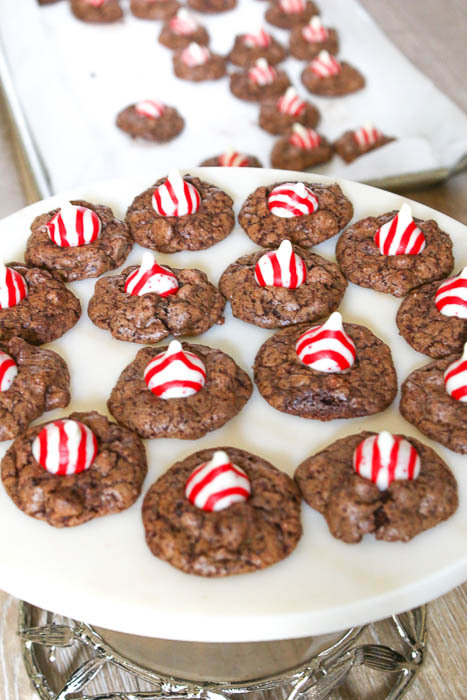 I tinkered with the Chocolate Chip Brownie Cookies just a tad and then topped them with gorgeous red and white peppermint kisses. I learned a really good lesson about peppermint kisses. They do not melt evenly. 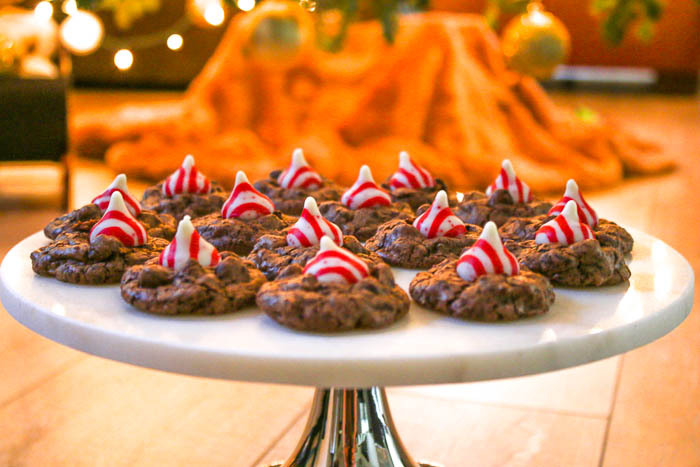 The kisses are put on top of the cookies as soon as they come out of the oven. Once the cookies cooled, I tried one. Ok, I really tried three but who’s counting? The kisses were firm on the outside but the inside was completely melted. 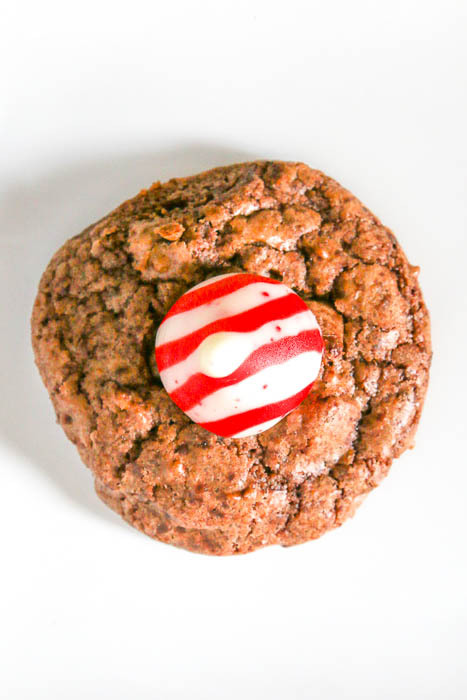 On the one hand, I couldn’t get enough of the heavenly ooey-gooeyness when I bit into the peppermint kiss. Yet, I also wanted the kiss to hold it’s shape when I took a bite. I put the pans into the refrigerator for a bit to see what would happen. It takes a longer time period for the kisses to firm up than it does for the cookies to get cold. After eating half a batch (almost!) I can say, unequivocally, that you can’t go wrong either way. The center when it is overflowing with hot melty yumminess is outrageous but so are the cool cookies with the solid kisses. 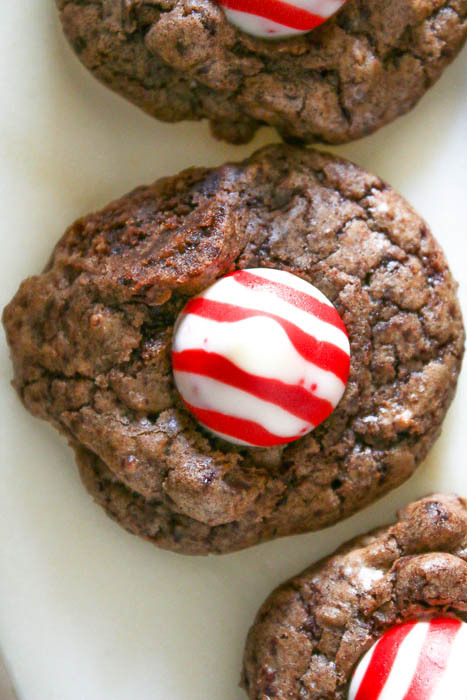 Let me know which way you prefer your Peppermint Kiss Cookies. Click on the following links to buy your very own Nordic Ware Baking Pan, Hershey Peppermint Kisses and Barry Callebaut Chocolate Chips. Place the unsweetened chocolate and sugar into a food processors. Process until the chocolate is finely chopped. Add the butter, eggs, coffee, vanilla and peppermint oil. Pulse on/off until blended. Pulse in the flour and salt. Lastly, add the chocolate chips and pulse on/off just until the chips are incorporated into the dough. While the cookies are baking, unwrap the kisses. 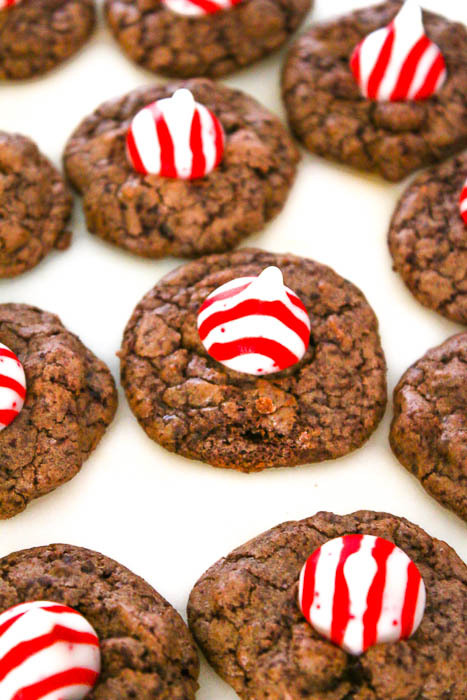 As soon as the cookies come out of the oven, place a peppermint kiss on each cookie, gently pushing it in just a bit.